Possible light codes, their meaning, as well as ways to eliminate errors are listed in the table on the next page. The data of the light codes in the first column indicate the number of short light signals issued (the burning time is about 0.4 s), the number of subsequent long light signals (the burning time is about 0.8 s), and the number of trailing short light signals. Error code 2-1-4 “Exceeding speed” consists, for example, of two short, one long and four short light signals. If you can not solve the error using the methods listed in the table, contact your local authorized DEUTZ partner. When all errors are eliminated, the error indicator lamp goes out. At some errors it is necessary to switch off ignition, to wait 30 with and only then again to include ignition. 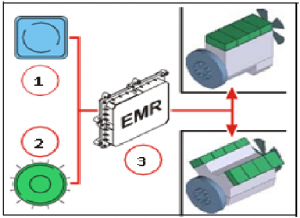 Depending on the construction of the monitoring function, the EMR3 can protect the engine from damage in some emergency situations, monitoring compliance with important limit values during operation and verifying the proper functioning of the system components. When the sensor fails, the corresponding monitoring functions are disabled. Only the sensor output is faulty in the fault memory. The requirement to switch off for the person carrying out the operation. Attention: if non-observance is lost, the warranty is lost! Automatic engine shutdown after a short warning time, possibly related to start-up. Forced engine operation at low idle speed for engine cooling, if necessary with automatic shutdown. The diagnostic button (1) makes it possible to read the existing errors in the form of light codes. The diagnostic button (1) and the error indicator light (2) are located on the control panel of the vehicle. The occurrence of errors indicates the flashing or continuous burning of the error indicator light (2). To get more precise information about all the errors that exist, they can be read in the form of light codes as follows (only when the engine is off): After pressing the diagnostic button (1) for at least one second, the error indicator (2) goes out and the first error is issued as a light code after releasing the button. Light codes should be decoded according to the table on the next page. After issuing the error light code, the error indicator lamp (2) goes out for five seconds. Then, by repeatedly pressing the diagnostic button (1), the following error (i.e., the next in the error memory) can be displayed. If the last error is displayed, the next time you press the diagnostic button (1), the first error will be displayed again.